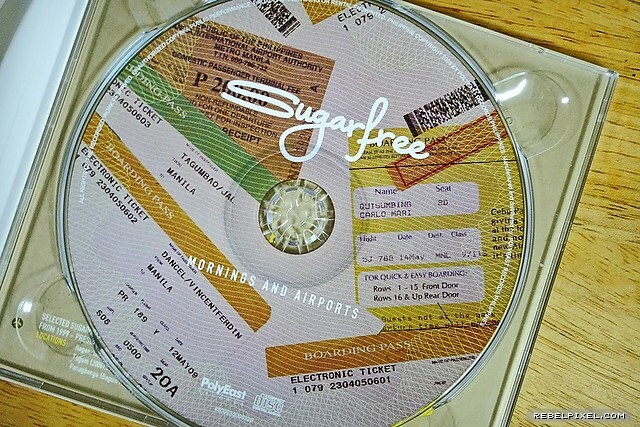 The first time we heard about Sugarfree’s latest album, Hana and I eagerly waited for news on its final release. The moment we heard that it’s supposed to be on its way to the record stores, I sent an SMS to the band’s number just to ask which shops already have their stocks. Unfortunately, their manager told me it might take a few more days since the CDs just arrived that afternoon; she added though they’d have copies of it available in their gig later that night. I was told they were playing at 70’s Bistro, though it was on such short notice since someone else was supposed to play on that date. So off we went to 70’s Bistro, hoping to get a copy of Mornings and Airports. There weren’t much people as the gig was largely unannounced. Our hopes were surely not dashed as we had one of only six copies they managed to sell that night. And to make it even sweeter, we got all of Sugarfree to sign it! 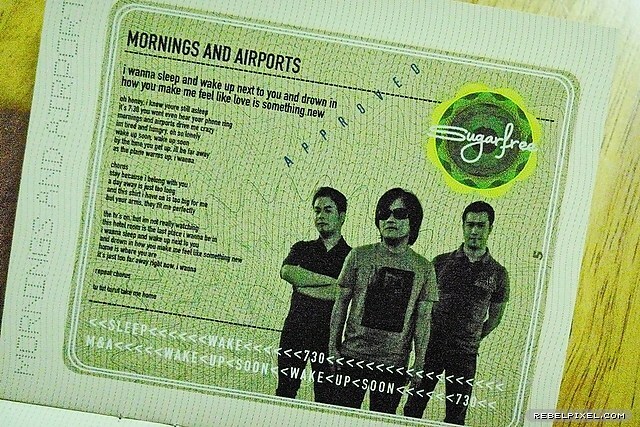 Mornings and Airports’ album insert certainly is one of a kind. Designed to look and feel like a well–used passport, the pages appear filled with stamps and stickers documenting the album’s songs and the band’s history. Also included is a nice sticker I wouldn’t dare waste on just anything yet. 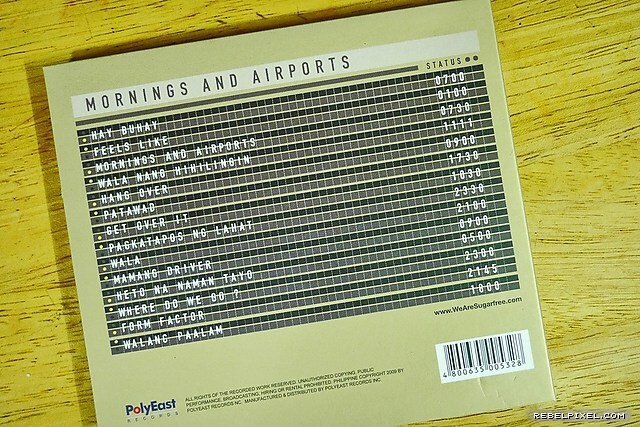 Inksurge’s design work on the previous album Tala–Arawan was excellent though I think they did even better with Mornings and Airports. I was initially under the impression that tracks from Mornings and Airports were not as catchy as those in Tala–Arawan. 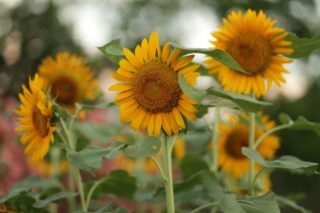 “Hay Buhay” though is a different thing: it tells a story of life rarely put beautifully in a catchy song. It is so easy on the ears that you’re singing to it even on just the first time you hear it. A few loops and shuffles and a few days later, I finally got to hear and “see” the songs in a more than casual manner. For starters, this album has more English tracks than you’d expect in a Sugarfree album. This is the most likely cause for my initial impression regarding the songs’ “catchiness.” Just as Ebe told us as we spoke to him after the gig, the songs have gone through a lengthier production process that put a different flavor to them. I must agree, they don’t sound as raw as their earlier hits, they seem more “mature” in technical terms, yet the most important ingredient is more evident than ever: strong songwriting that always seem to speak directly from the heart. Surprisingly, four of the 14 tracks were not written by Ebe; Jal and Kaka have contributed two each. Kaka has “Get Over It” and “Where Do We Go?,” both of which are good English tracks. His songs put a nice twist to their sound and considering these are his first contributions, I think he deserves to write more for their next albums. Jal’s “Patawad” and “Form Factor” almost immediately scream of lost love. Whatever his reasons may be for writing those two songs, they’re right up there with Ebe’s best on this record. “Wala,” “Hang Over,” and “Wala Nang Hihilingin” are the tunes that will haunt you. They’ve got the chorus–you–can’t–forget trademark of Ebe’s hits paired with vocal melodies that flow smooth like silk. If I had to pick a favorite song though, it would be “Heto Na Naman Tayo.” The song’s theme is typical Sugarfree—heartbreak. The music’s just as typical, launching Ebe into his iconic melodious wail. But it’s how typical Sugarfree’s music is that has kept us singing their anthems—it’s just like speaking from your own heart. Pingback: Music Review: Chimaira - The Infection : Give Me a Music Revolution! Yeah, sulit sya. I think it’s as enjoyable as the first one, if not better. Grab a copy! Is there a way to get their album outside the country? 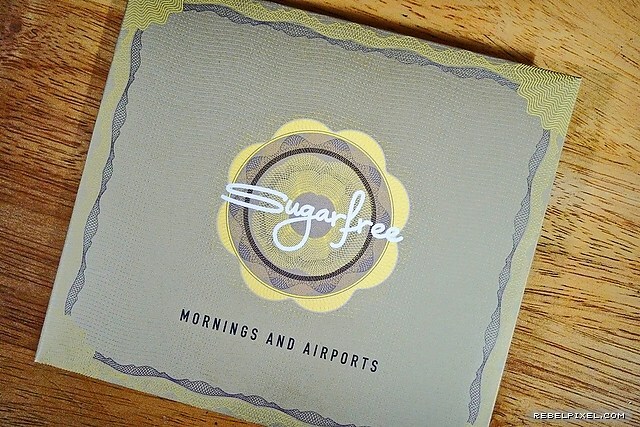 I’m a Sugarfree fan and I was ecstatic when I found out they released a new album. Ang galing…my sentiments exactly! Down to not hooking onto the songs right away as I did in previous albums.